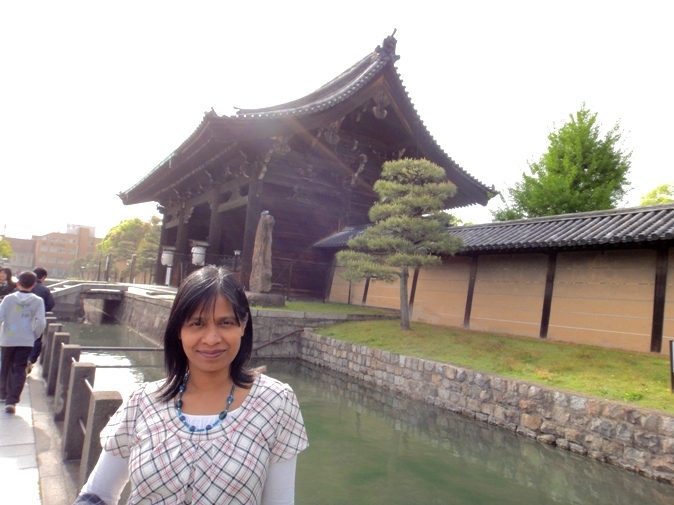 On the afternoon of May 2nd, hubby and I visited Toji Temple in Kyoto. Toji Temple, formally known as Kyo-o-gokokuji Temple, is a Buddhist temple of Shingon sect. 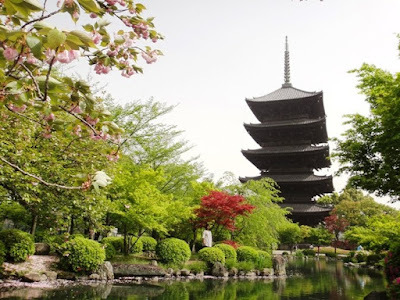 In 794 Emperor Kammu transferred the capital of Japan from Nara to Kyoto. 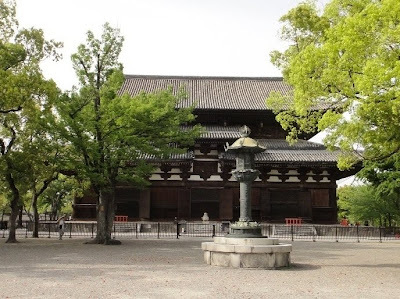 In 796 during early Heian Period, he built two huge national guardian temples named Toji on the east side and Saiji on the west side of Rajomon which was the south gateway to Kyoto. In 823 Emperor Saga conferred the abbotship of Toji Temple on Kukai who made it a seminary for the practice of Shingon sect esoteric Buddhism. The principal image of the temple is Yakushi Nyorai. Most of the buildings of the temple complex were destroyed by a fire in 1486 but were rebuilt with the support from Toyotomi and Tokugawa clans. None of the original buildings remain today but the rebuilt structures were reconstructed in the original scale and architectural style. 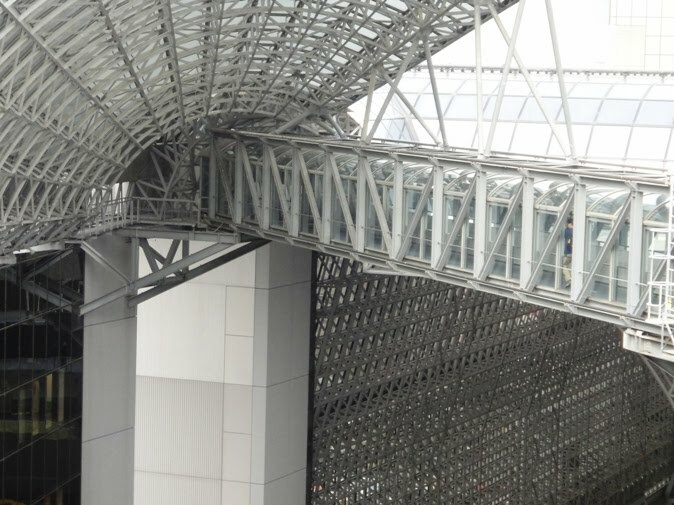 Several of these rebuilt structures including Nandaimon Gate, Kondo Main Hall, Kodo Lecture Hall, Jikido Refectory Hall, and Kitadaimon Gate are laid out along a south-north axis. 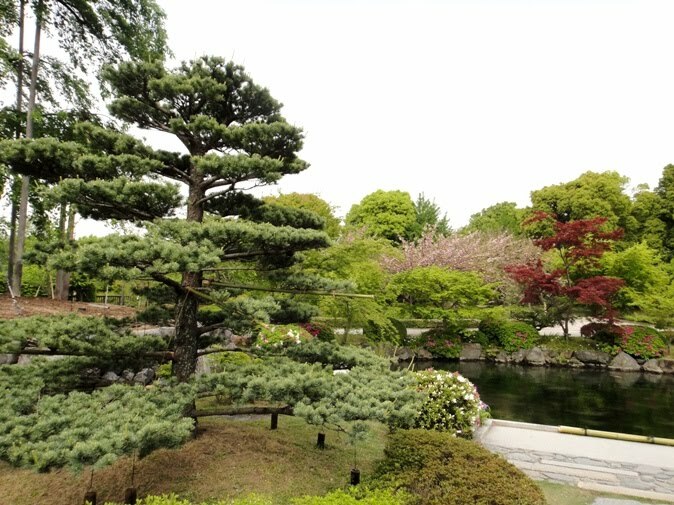 This straight-line arrangement called garanhaichi reflects the original layout configuration of the temple and retains the feeling of Heian Period. The temple was designated as an UNESCO world heritage site in 1994. 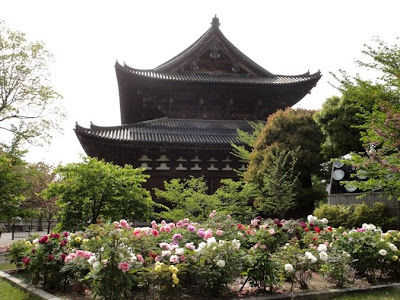 It should be mentioned that the partner temple Saiji was destroyed by fire in 990 and 1233, and then it had fallen into ruins and only the ancient site remains today as a park. 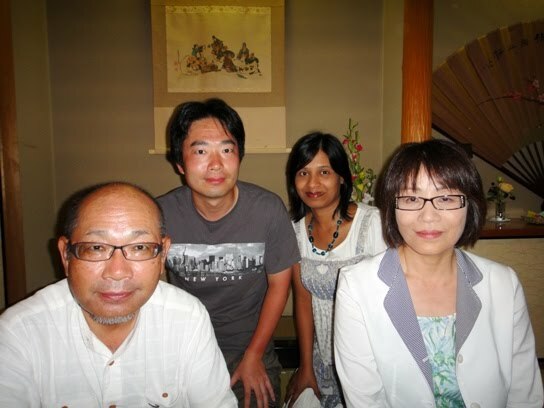 In the morning, we had visited a few interesting spots and the last one was Hokokubyo Mausolem. 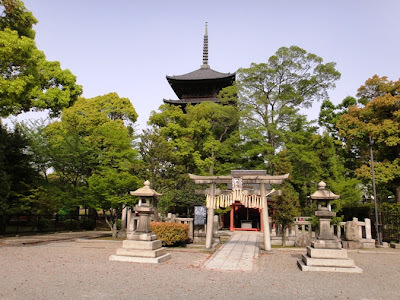 Toji Temple is located about 4 kilometers southwest of the mausoleum and it took us 15 minutes to reach the temple by taxi. The temple is situated in Minami-ku ward near the intersection of Omiya Street and Kujo Street. We got off the taxi right in front of Keigamon Gate on Omiya Street. 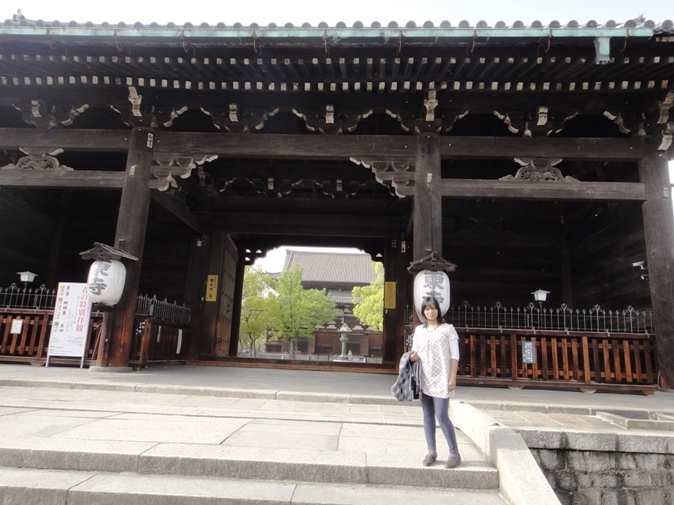 We entered the temple premises through this gate located on the northeast side. We walked through the northern area of the temple complex and saw several interesting structures like Kitadaimon Gate on the northern side and a huge pagoda far in the southeast corner. 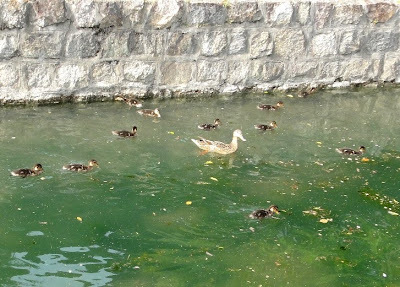 We were a bit tired due to climbing several hundreds of steps earlier in the day, and so we took rest for some time near a water house and enjoyed the serene atmosphere of the temple grounds. 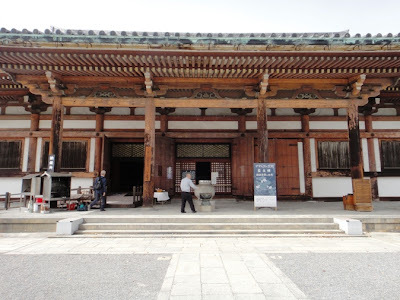 We saw a building named Jikido Refectory Hall located south of Kitadaimon Gate inside the temple complex. It was the living quarters and eating area for the monks. 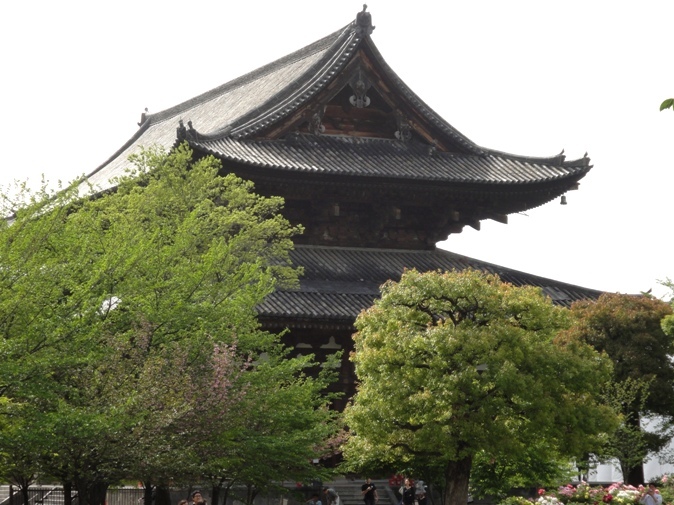 Although the exact year of the construction of the original structure is unknown, it was built sometime during Heian Period. In 896 Priest Rigentaishi Shobo made statues of a six-meter tall Senju Kannon Bosatsu (presently kept in Homotsukan Hall treasuries) and four heavenly kings Shitenno and enshrined them inside this hall. Therefore this hall is also known as Senjudo. 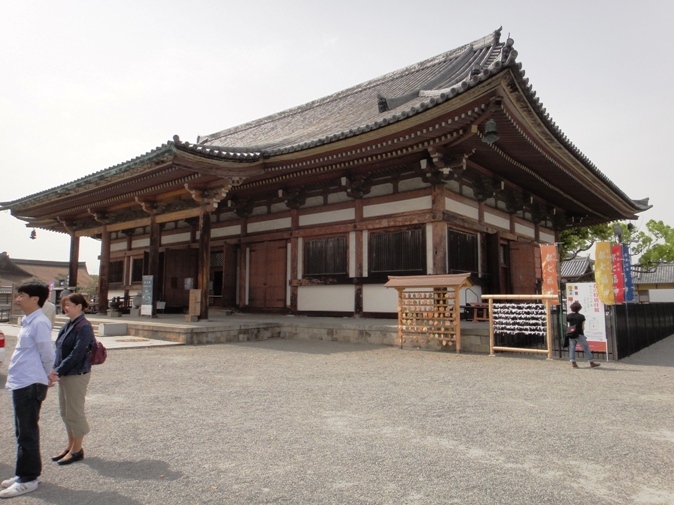 When Ashikaga Takauji made Toji Temple his base of operations, he sometimes lived in this building. The building was lost in a fire in 1930 and the present structure was rebuilt in 1934. 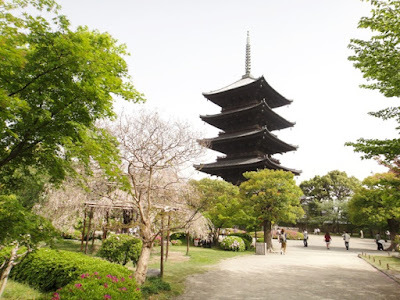 Although entry to the temple grounds is free, visitors should pay 500 Yen to approach and view a few buildings, namely, Kondo Hall, Kodo Hall, and pagoda. We had to pay 800 Yen per person as admission fee because we happened to be there on one of the few days of the year when pagoda is open to the public. On entering the paid area, we saw a beautiful garden to our left on the eastern side of the temple complex. The garden extends towards the south and we leisurely strolled through it. 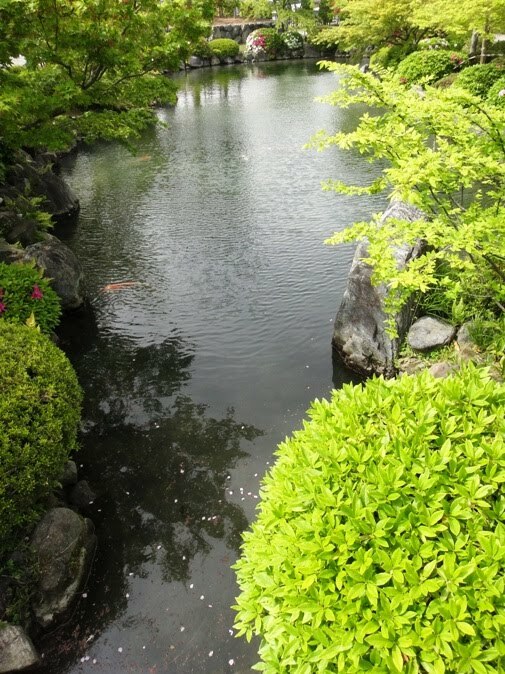 The garden has a pond named Hyotan in which turtles and koi swim. 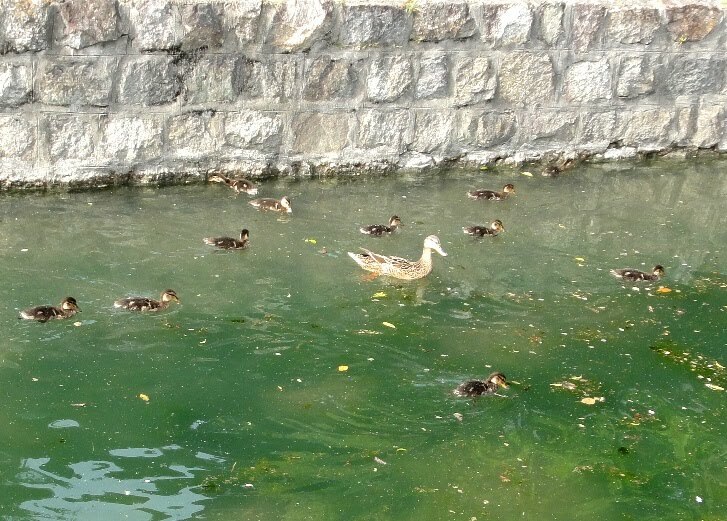 Although we saw many big colorful koi fishes but we did not see any turtles. 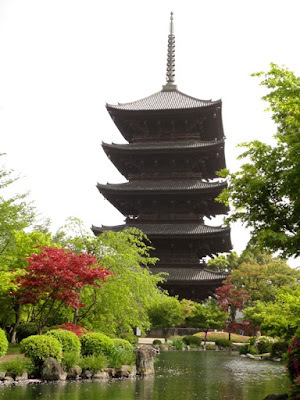 We saw the beautiful and magnificent pagoda at the far end of the garden. 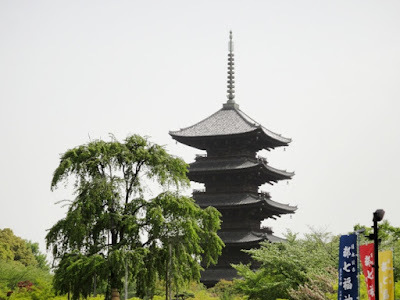 As we walked towards the south, more number of roofs of the pagoda became visible. We walked back a few steps and reached an excellent spot in the garden from where we got a wonderful view of the garden, pond, and the five-storied pagoda. We spent almost 20 minutes here as the place was so serene. We strolled through the garden and reached right in front of the huge magnificent pagoda. 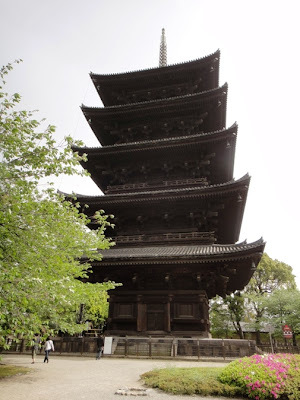 The five-storied pagoda is the symbol of the temple and is also well known as a landmark of Kyoto. 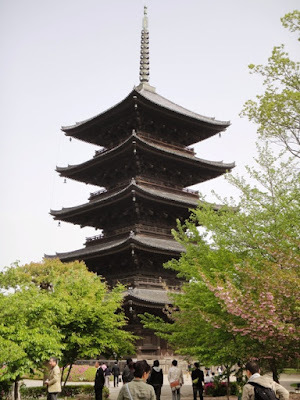 The pagoda is 57 meters tall and is the tallest existing wooden pagoda in Japan. 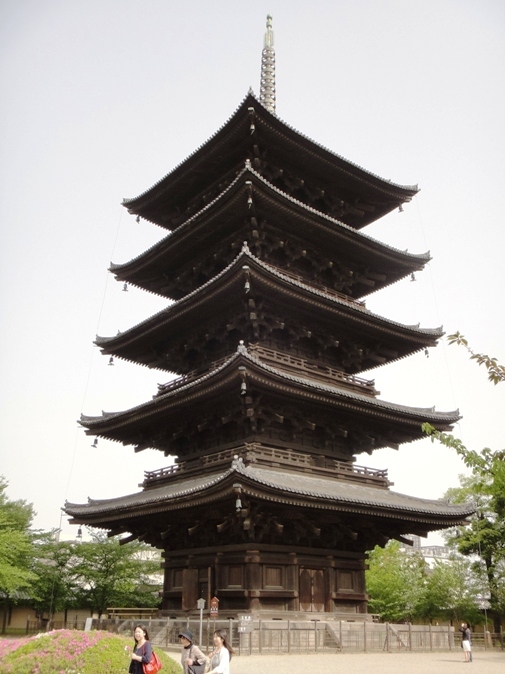 The present pagoda is a reconstructed structure dating from Edo Period and is now designated as a national treasure. The original pagoda was built by Kukai in 826. 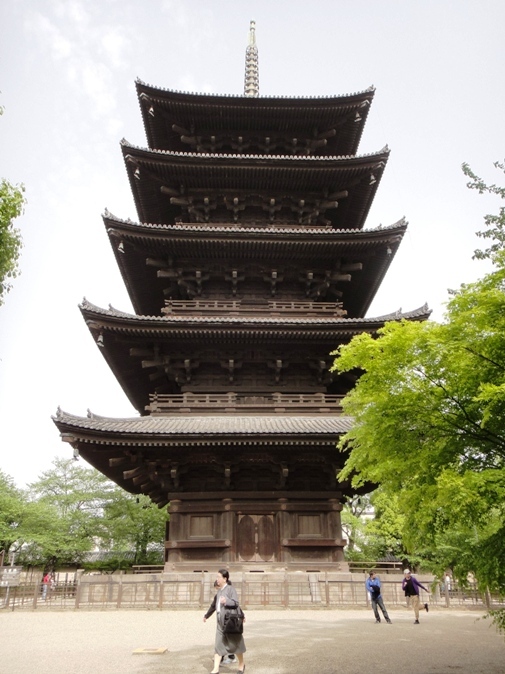 It burned down four times as a result of being struck by lightning, but was rebuilt each time. The present pagoda was built by Tokugawa Iemitsu, the third shogun of Tokugawa Shogunate, in 1644. 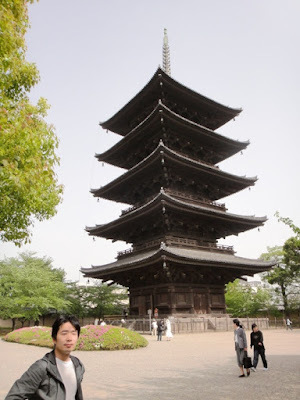 It is the fifth pagoda to stand on the same spot. In order to protect the pagoda from another occurrence of this type of fire, it now has a lightning rod fitted on the crown. 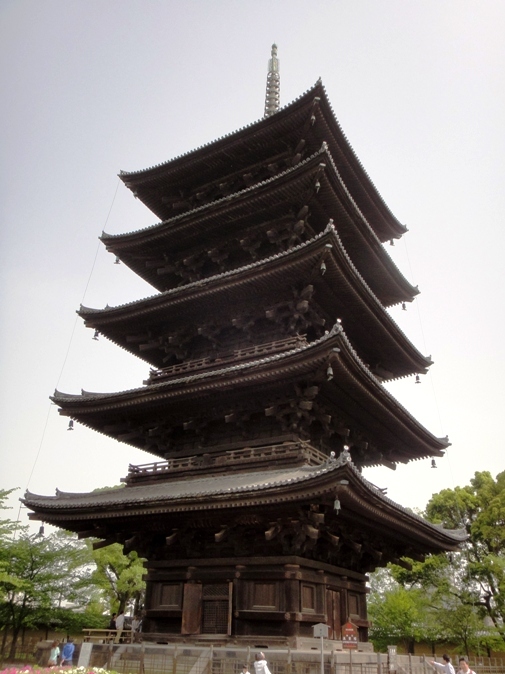 We took several photos of the pagoda from various positions and angles. The interior of the pagoda is not normally open to the public. But because we visited the temple on one of the few days of the year when the first floor of the pagoda is open to the visitors, we could enter inside. 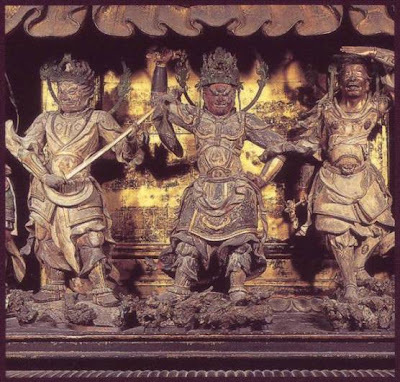 Inside are placed the images of Four Buddhas and their followers, the Eight Great Bosatsu. Pagoda as viewed from a distance inside the paid area. The spire is fully seen in this photo. 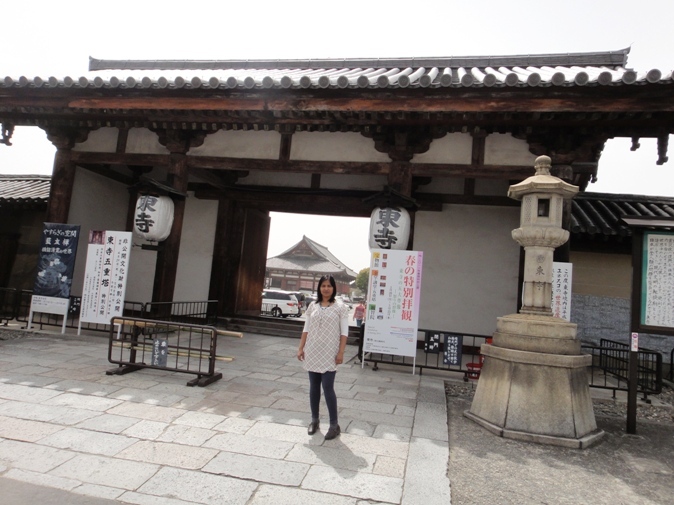 Next, we visited Kondo Main Hall. 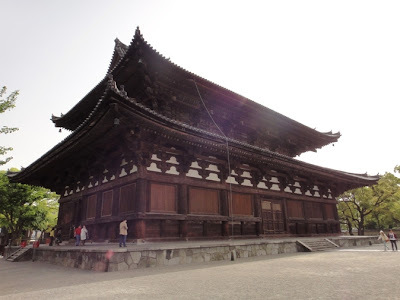 Kondo Hall is a reconstructed structure and is the largest wooden building in the temple complex. The original hall building was constructed in 796. 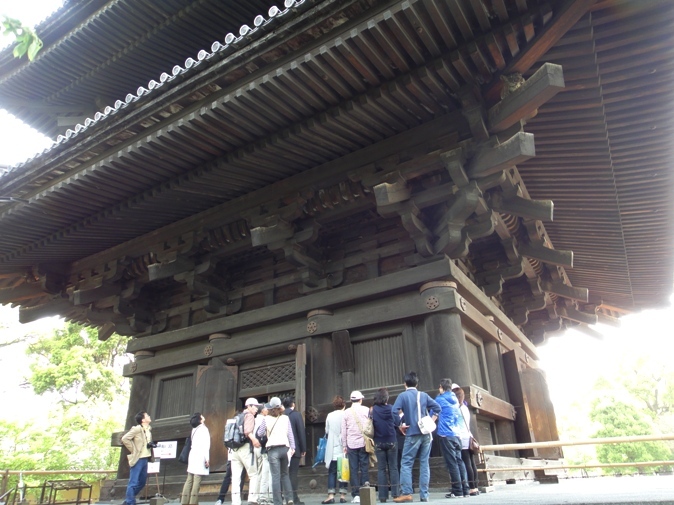 It was destroyed by a fire in 1486, and was reconstructed by Toyotomi Hideyori in 1603. The hall was rebuilt to the same scale and at the same location as the original one. The hall has double-roofed irimoya style architecture. The raised central part of the lower roof offsets the regularity of the front view of the building. This is a unique construction style because Tenjiku (ancient Indian) style was introduced into the traditional Japanese architectural style. 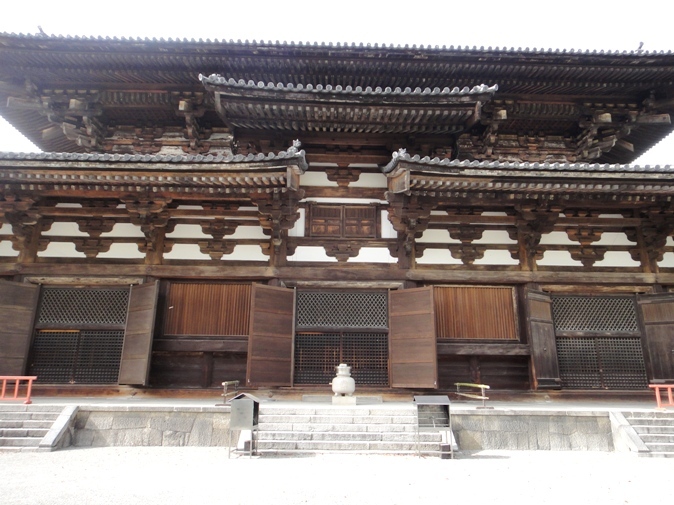 This hall building is a good example of Azuchi-Momoyama Period architecture, and is now designated as a national treasure. We took several photos of the building from various positions and angles. The main object of worship of Toji Temple is housed in this hall. 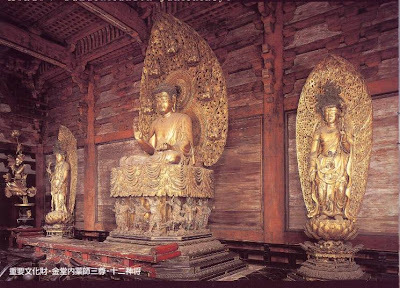 Wooden statues of Yakushi Nyorai Triad, Yakushi Nyorai in the centre flanked by his two attendants Nikko and Gakko Bosatsu, are enshrined in the hall. 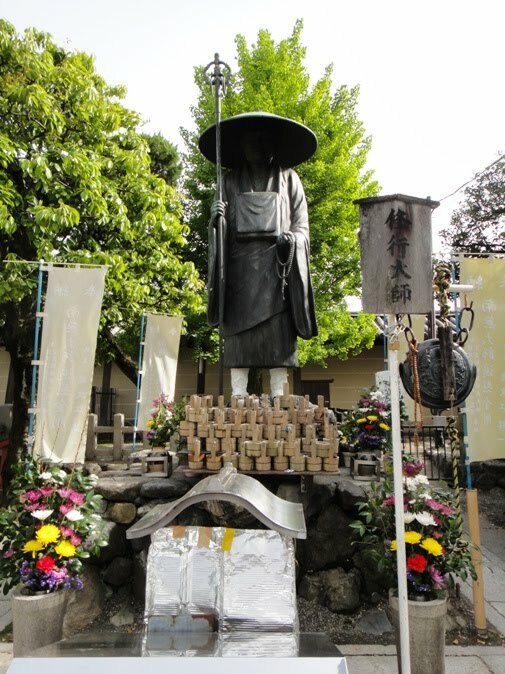 Statues of the twelve Sacred Generals are placed under the seat of Yakushi Nyorai. These statues are said to have been carved by a sculptor named Kosho in 1603. The statues of Yakushi Nyorai triad seemed so real and looked filled with mercy. 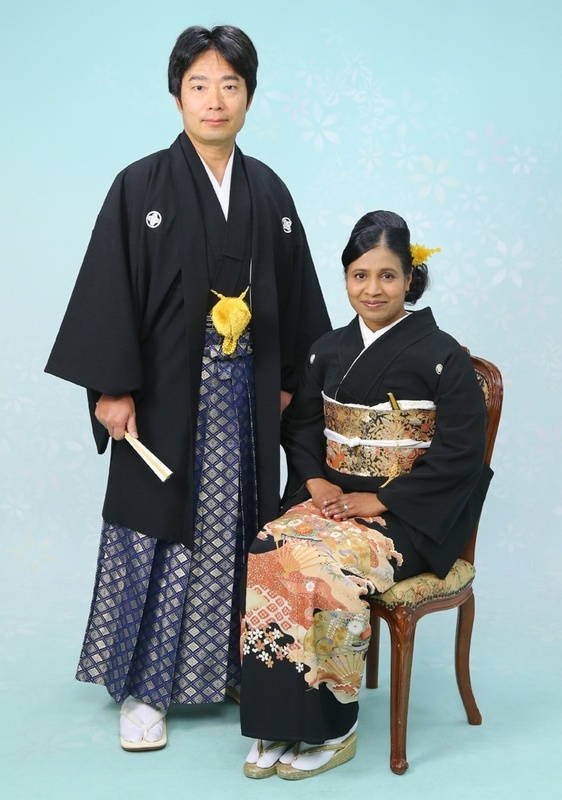 I prayed for the health and well being of hubby and me. Unfortunately photography is not allowed inside the hall, so I took photo of images from the pamphlet of the temple that we got along with the tickets to enter the paid area of the temple complex. Kondo Hall as viewed from the south at a close range. 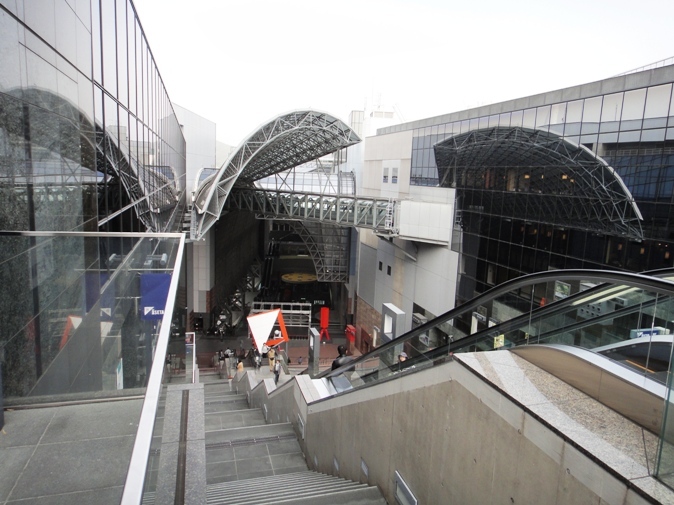 Note the raised central part of the lower roof in the photo. Kondo Hall as viewed from the south from outside the paid area. A stone lantern is seen in the foreground. After seeing Kondo Hall, we left the paid area of the temple complex. 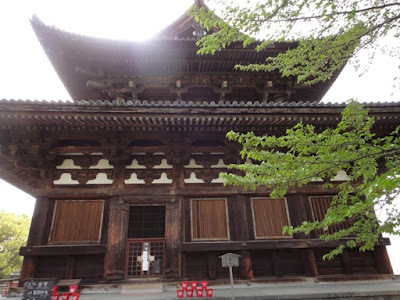 There were several other interesting buildings and structures inside the temple complex but we skipped seeing them. 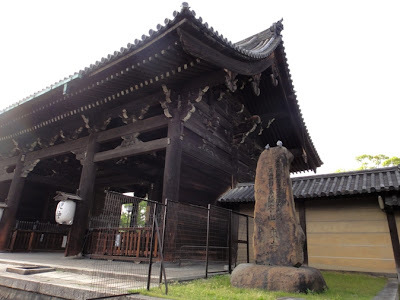 Later we walked towards the southern area the complex, and saw a statue of Kukai at the southwest corner area. 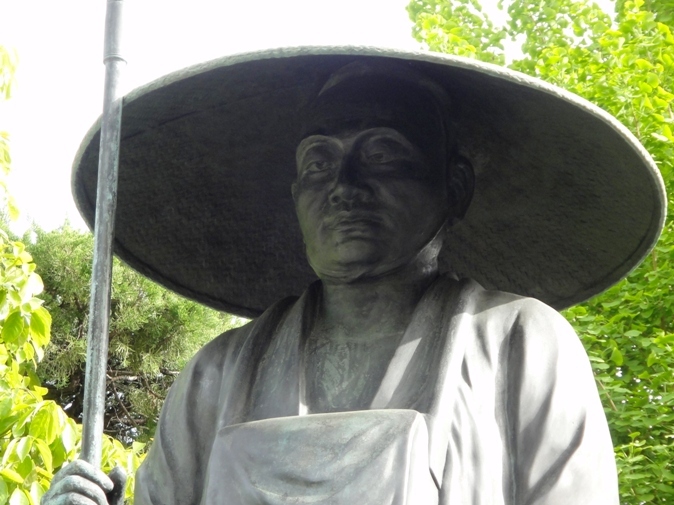 The statue of Kukai looked very mysterious as his face was obscured by the shadow of his hat. So we also took a closer view of the statue where the expression on Kukai’s face looked very powerful, and full of wisdom and enlightenment. 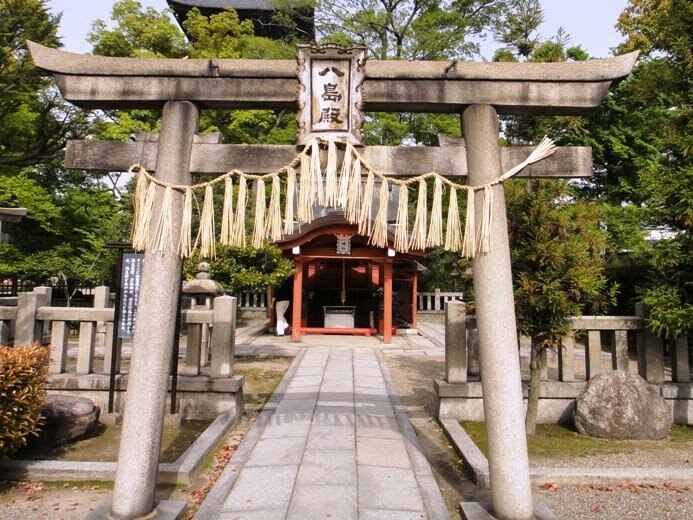 A small shrine named Yashima-den is located towards the south-southeast area inside the temple complex. 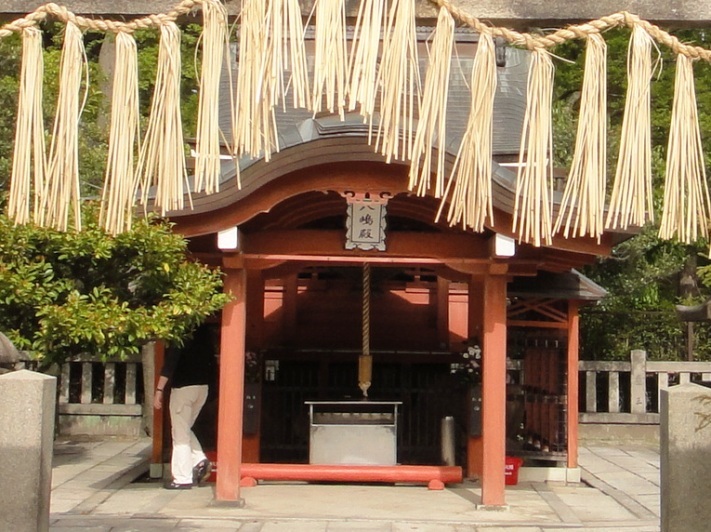 Ohnamuchi-no-kami, the god of the land of the temple complex, is enshrined here. 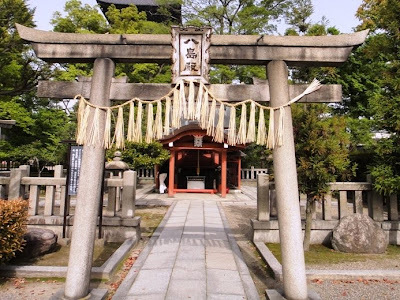 Legend has it that Kukai dreamt of this god, and so he made this shrine. 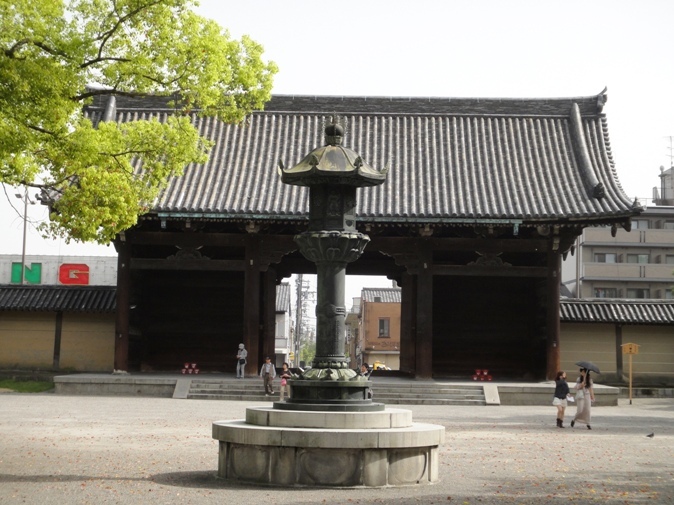 Although the exact year of the building of this shrine is unknown, it was built much earlier than Toji Temple. I prayed at this shrine. Afterwards we left the temple premises from Nandaimon Gate located on the south side. 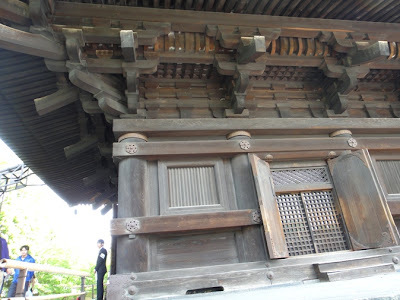 This gate on Kujo Street is the main gate of the temple. 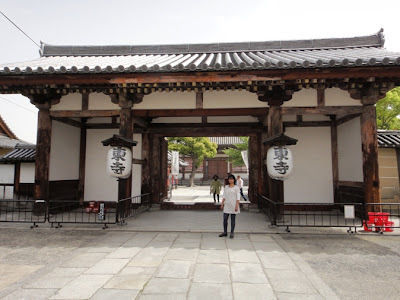 This eight-pillared gate was originally the west gate of Sanjusangendo Temple, and was transferred to Toji Temple in 1894 as part of the memorial works commemorating the 1100th anniversary of the transfer of capital from Nara to Kyoto. 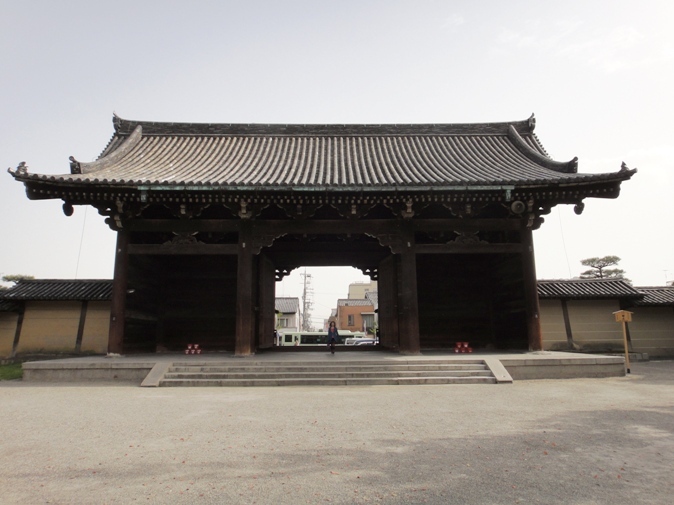 This gate is now designated as an important cultural property. We took several photos of the gate from inside as well as outside the temple complex. 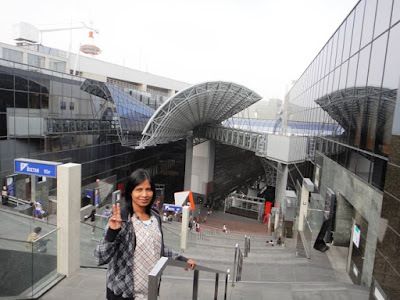 After leaving the temple premises, we walked up to Kyoto Railway Station. Nandaimon Gate and a stone lantern in the foreground as viewed from the north inside the temple complex. 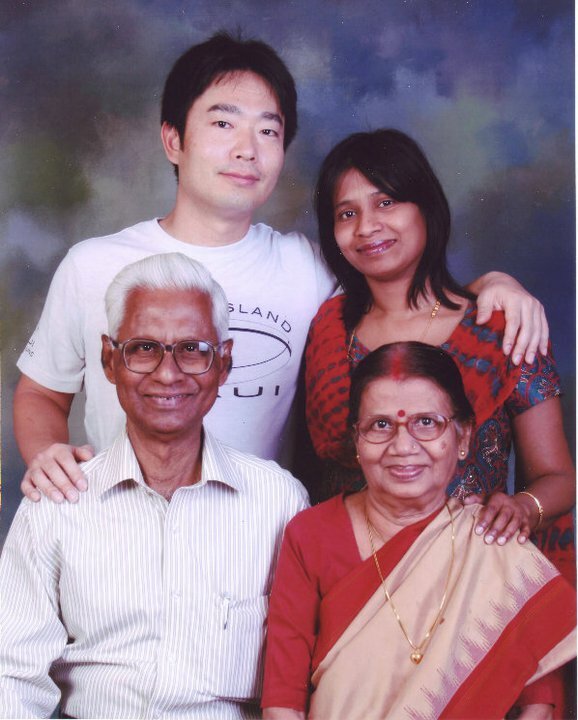 This photo was taken from the verandah of Kondo Hall. Nandaimon Gate as viewed from the southeast outside the temple complex. A stone monument with an inscription of the name of the temple is also seen. Kyoto Railway Station is located about 1.5 kilometers northeast of the temple, and it took us about 25 minutes to walk up to the station. 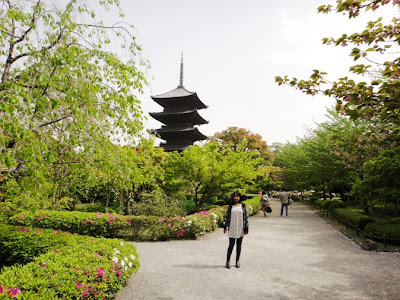 Toji Temple was the last sightseeing spot we visited in Kyoto during our three-day trip there. Later in the day we went to hubby’s ancestral home in Nagoya by train, and had to wait for about two hours at Kyoto Station. So we just moved around inside the station, and realized that the station building is an ultramodern glass and steel structure in striking contrast to the temples and shrine we visited earlier. 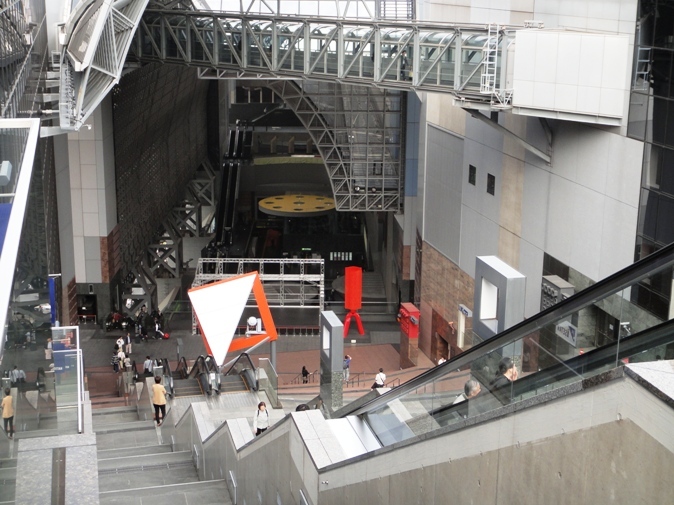 We took a few photos of the station. 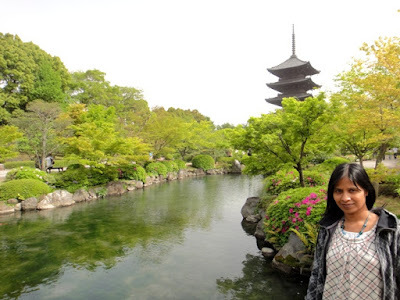 We loved visiting various temples and shrines in Kyoto. It was an interesting, entertaining, and stimulating experience for us.